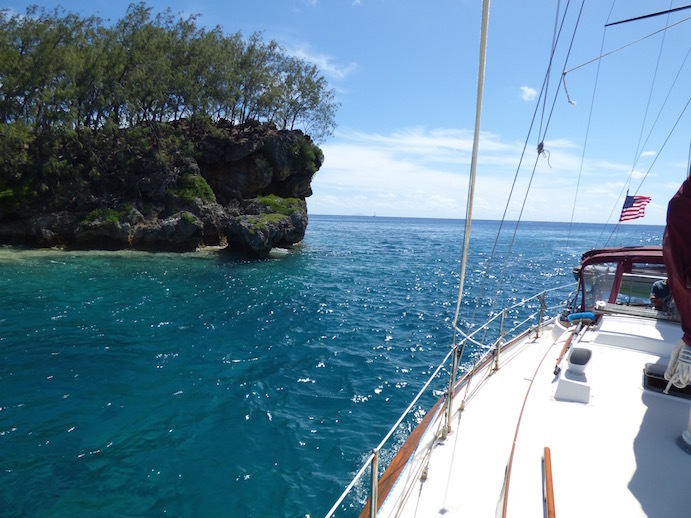 Panorama view of Hunga Lagoon’s entrance from Journey’s bow. Journey, approaching Hunga Lagoon’s entrance. “When’s high tide?” and “What’s the water depth at the entry pass?” are probably the two most frequently asked questions regarding Hunga Lagoon. Fortunately Barry of Hunga Haven’s usually on tap to reassuringly answer both. Bottom line? While not an unobstructed wide open entry, Hunga Lagoon is generally navigable, though a bit nerve wracking. 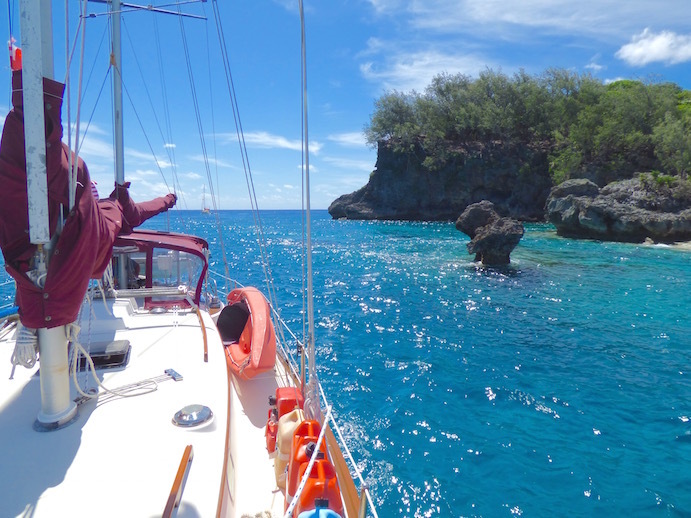 It’s deep enough to not ground most sailboats, and plenty wide enough to get through, but it is hemmed in by cliffs on both sides, with a nice big rock roughly 1/3 of the way into the narrowest point of the entrance. Plus, Hunga Lagoon also has a “false entrance” that would prove devastating for any boats taking it by mistake. All the cruising guides we saw were very clear on which the correct versus the false entrance, with photos, latitude and longitude, and descriptions. Looking left at the cliffs at the Hunga Lagoon entrance. “Where’s the rocks?” Wayne asked, a bit nervously, while I scoped out the best track for us from the bow as we came through Hunga Lagoon’s entrance. 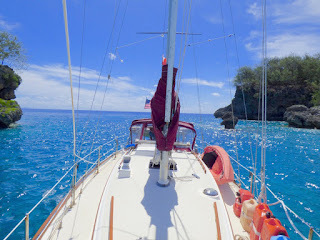 “It looks fine,” I replied, unaware that our depth sounder was showing only 3.7 feet below our keel. Honestly, it was clear. It didn’t look that shallow, and there was no point that looked demonstrably better or worse that a straight shot from beside the occluding rock and the anchorage. Journey, through Hunga Lagoon’s entrance, looking back. You can tell it’s a little tight! Wayyyy wider than the entrance to Eleuthera’s Hatchet Bay in the Bahamas (click here to get a sense for that). Exiting Hunga Lagoon was easier, though we had to tell the yacht hovering back in forth at the lagoon entry, “We’re coming though.” After all, we weren’t sure what their plans were, but ours were clear enough to us. We were even more mystified at the sailboat that appeared anchored immediately outside the entrance, which was riddled with jagged rocks and chasms. We enjoyed our time in Hunga Lagoon, safe from the high winds outside, but with calming weather outside at last, it was time to move on. following us through Hunga Lagoon entrance. This post was finalized and posted in Neiafu, TONGA ( S18.39.443 W173.58.965) and was inspired at our recent stay in Hunga Lagoon (S18.42.066 W174.07.551),Tonga’s Vava’u island group, where we’re currently cruising. WindGuru’s red-orange colors – windy! Up to 27 knots! – encouraged us to extend our stay in Hunga Lagoon. 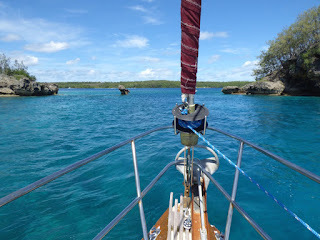 There, unlike “outside,” the water at our anchorage was glassy-smooth. As of our start, December 7th 2014, from Jacksonville FL NAS, USA until our current (October 12, 2015) travels around the Neiafu, Tonga are -- 10 months, we’ve spent about a third of our time --125 days -- sailing and covered ~8,750 nautical miles. The prior 2 years combined, we sailed 3762 miles. By the time we arrive in New Zealand in November, less than a year from when we set out, we expect we’ll sail over 10,000 miles this year. That’s a lot of miles for a boat with a hull speed of 7 knots; we usually sail far slower than that. Nuku Tonga -- Beach Day -- At Last! Tonga’s Blue Lagoon: A Stunner!